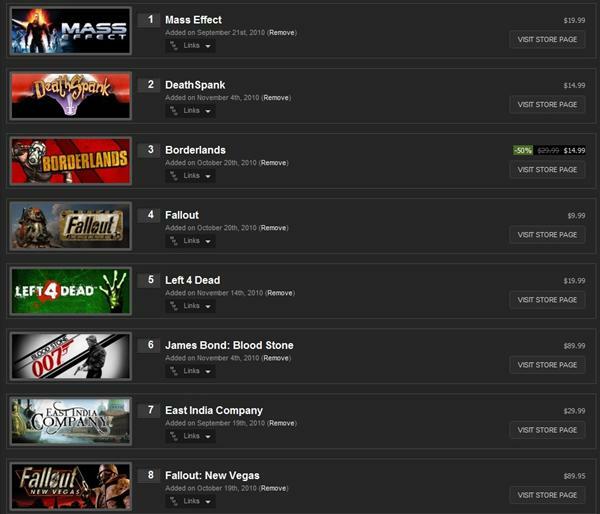 Steam has become almost synonymous with PC gaming in recent years. Even though it’s a form of always-online DRM (Digital Rights Management), the benefits outweigh the costs. One of those benefits are the insane amount of sales and deals the service offers. When a Steam Sale starts, there is always a frenzied dash to purchase all the games they’ve been eyeing the past few months. Inevitably, in every sale someone gets upset because they feel they’ve gotten ripped off. They bought a game one day and then the next day it was discounted for 75% off. 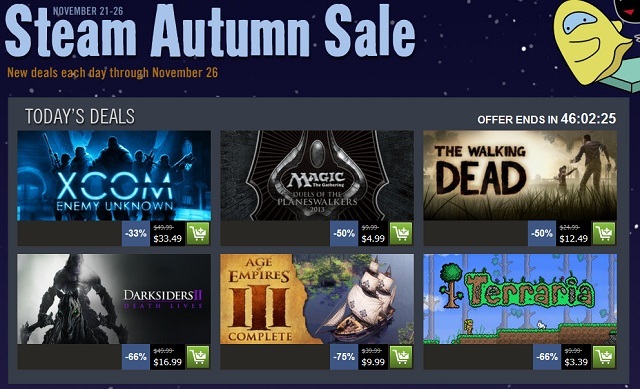 While it seems unfair on the surface, a Steam Sale is a game unto itself. That person got a raw deal, not because the sale was unfair, but because they simply didn’t understand the way the game is played. To survive the war Steam wages on your wallet multiple times a year, you need to know your enemy. The first half of this article will enable you to become familiar with the various battlegrounds Steam opens up during sales. The latter half will give you a strategy to get the most for your money without draining your entire bank account. If you already know Steam’s modus operandi, feel free to skip to the second section of the article. What is a Steam sale? 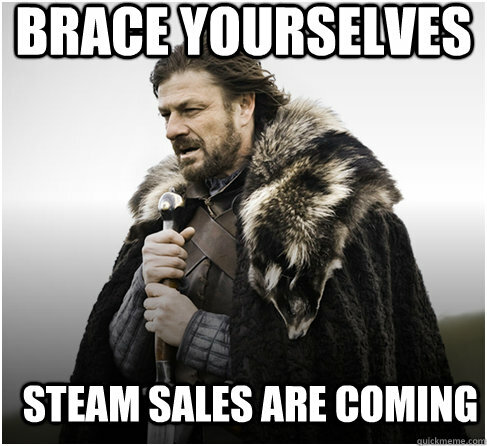 Steam runs smaller sales all year round. They have daily deals, weekend deals, and even week-long deals that give some pretty good discounts, usually 75% off. 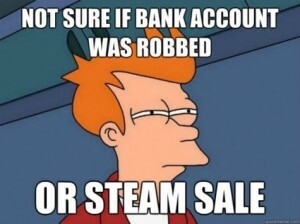 Steam sales are something special though. A couple times a year for anywhere between a week and two weeks, hundreds of games get huge discounts with a daily, and sometimes hourly-based, rotation. These discounts can range anywhere between 25 percent off for newer games, to 75 or 80% off a title. Each Steam sale is slightly different, but there are a few steady showcases that have been used consistently for the past few sales. 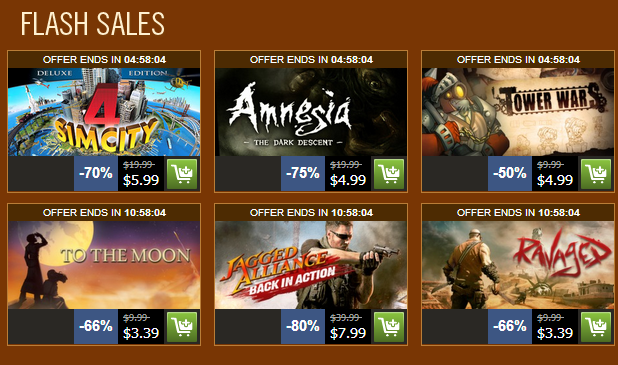 These deals are prominently featured on the main store page when you launch Steam or visit the website. These deals are rotated daily, hence the name, with an extra 12 hour window when the next set of daily deals become active. For instance, if the daily deals in your region are added at 12p.m. July 1st, those daily deals won’t expire until midnight July 2nd. This gives you almost two whole days to evaluate your purchase. The main rule to note is that the price you see for a game on a daily deal is the lowest price that game will hit during the length of the sale. These deals are somewhat of a mystery. There are usually four deals and last only a few hours before being rotated out. Deals are usually active for 6, 8 or 12 hours at a time, but there isn’t a consistent pattern to predict the length of time the next flash sale will be active. However, one rule that you can count on is if a game has a currently active daily deal it won’t be featured in the flash sale slot at the same time. 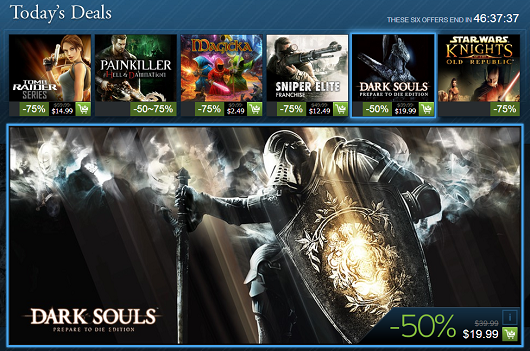 A game can, however, be a flash sale and a daily deal on different days. One good fact to keep in mind is that flash sales are in truth, rotating daily deals. The price a game gets on a flash sale follows the same rule as a daily deal; it’s the deepest discount the game will get during that sale. The price you see for a game on a flash sale will be the same price it will receive if it becomes a daily deal and vice versa. very sale has a number of publisher packs available that give you a crazy discount on every game a publisher has available on Steam. Some newly released games are left out of publisher packs, however (ex: Skyrim was released in 2011 and wasn’t included in Bethesda’s publisher packs for 2012). 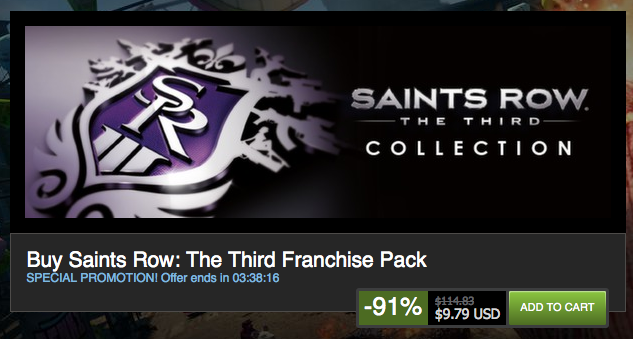 I don’t really consider these a good deal because most people are not likely to play every game in the pack and as you participate in Steam as a whole, you are likely to already own a lot of games in each pack. It’s usually cheaper to buy the games you want separately, but this is not always true. Your mileage will vary with each pack and sale. A franchise pack a great way to get into a series. For instance, a franchise pack could contain Max Payne 1, 2, and 3 with all DLC. Many times, newer games will be excluded from the franchise pack because it won’t be discounted as heavily, and also keeps the franchise pack cheap for players wanting to catch up on the series. Usually these packs also contain all DLC released for each game in the bundle. I’ve learned many of these tips from various forums and sites across the web and after having been through a sale or two, I can attest to their usefulness. You don’t need to use every tip given, but your wallet will thank you if you do. 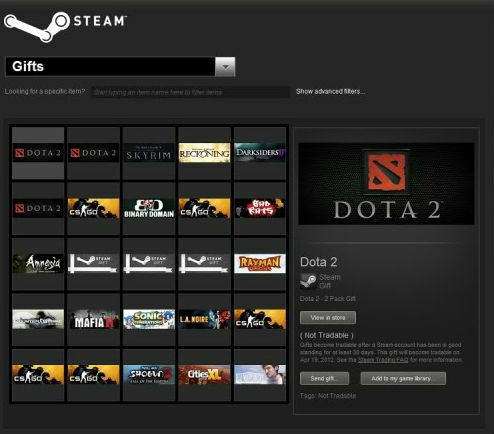 Steam allows you to build a wishlist that is attached to your profile. The wishlist is ranked by number, with Item 1 being the game you want most. Browse through Steam, when a sale is not running, and put games that look interesting to you on your list. This list also shows the current price of the game, so during a sale you can get a quick glance at your wishlist to see what kind of discount a game is currently getting. This tip also builds the foundation for other tips, so don’t skip out on this one. It’s also a nicety to your friends on Steam, because they can see your wishlist as well. This makes it easy for friends to purchase a game for you as a gift during the holidays or other special occasions. 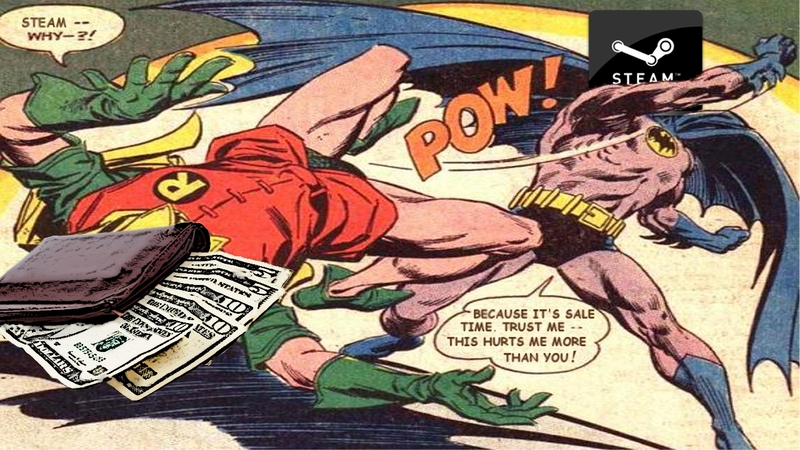 Jokes abound around the internet about how Steam beats up your wallet during sales (like the Batman pic above). If you make yourself a budget, you’ll be on stable ground so you won’t drain your account. Write down the amount you wish to spend and put it to the side. Now, think about your wishlist and how much you’re willing to spend, and ask yourself “If I can only buy one game, what game will that be”? Place that game at the top of your wishlist. Then ask yourself “If I can buy one more game, what game is that”? Place that in the second spot. Do this until you’re done ordering your wishlist or until you think you’ll be out of money. Whatever your budget, this method is a great way to ensure you’ll get something you really wanted out of a Steam sale. 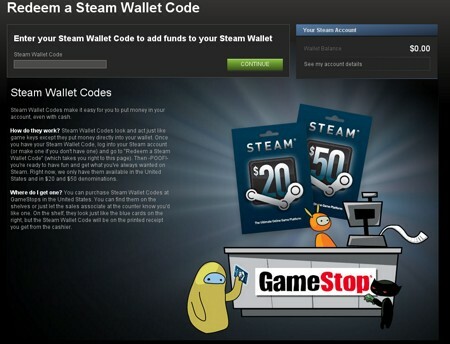 Steam offers a wallet system and gift cards which I recommend you take advantage of. You are able to pre-load what you want to spend into your wallet with your debit card or by gift cards sold in stores. By loading your wallet before a sale, you prevent quick, multiple transactions from going to your bank. Some banks may see this as unusual activity and stop your account until you contact them letting them know they are legit transactions. This can turn out to be a huge hassle, and is easily avoided by using the wallet system. 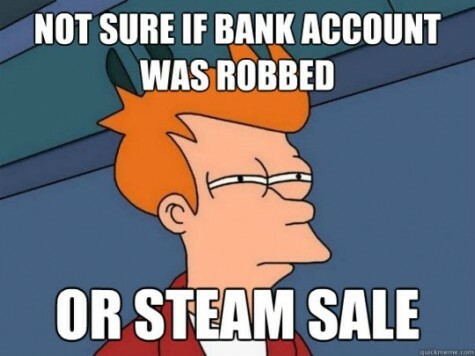 Steam also allows you to split pay if you don’t have enough money in your wallet to cover your transaction. For example, the game you want just went on sale for ten dollars but you only have five dollars in your wallet. When you purchase, it will use all the money in your Steam wallet and then ask for the price difference via debit card or other method of payment. Unlike other services, you don’t have to worry about having a random dollar or two left over in your account with nothing cheap enough to buy with it. Earlier in this article, I explained that daily deals and flash sales advertise the lowest price a game will receive during the length of a sale. This rule obviously explains itself and is where the majority of people get burned. Don’t buy a game unless it’s a daily deal or a flash sale. During a sale, the gaming community repeats this line ad nauseam but for good reason. If you’re going to “get burned” on a game, it’ll be because you bought a game when it wasn’t a daily deal or flash sale. There is only one exception to this rule. The last day of a sale, all bets are off. There won’t be any more daily deals so buy whatever games you were waiting on because they won’t be receiving a cheaper price. It’s also unlikely at this point the game you’ve been waiting on will have a flash sale, so don’t wait for that either. It’s inevitable you’re going to see some game you’ve never seen before, looks kind of interesting, and is incredibly cheap. I call these budget busters because you didn’t plan on even considering them. When a budget buster starts calling your name, you need to ask yourself two important questions: “How much of a time investment is this game going to be? Do I have that kind of time?” and “Am I interested in this game because I think it will be good or because it’s so cheap?”. It’s common for people to buy a ton of games that they simply never get around to playing. Steam’s deals can be too good to pass up sometimes, but if you restrict yourself to a budget, some of those deals can prevent you from buying what you really wanted. Don’t fall into that trap and really evaluate each purchase before you plunk down your cold, hard cash. Your Steam profile comes equipped with a public inventory system that allows you to trade coupons, games, Team Fortress 2 items, and other various pieces of digital content. When you purchase a game, you can buy it for yourself, buy it as a gift, or place it in your steam inventory for later. When you put a game in your inventory, you don’t own it yet. You just have access to a license for that game. You can trade or gift games and items in your inventory to other players. If you come across a budget buster that is too good to pass up, buy it and place it in your inventory until after the Steam sale. This will give you a way out should you decide later that you didn’t really want that game or bundle pack. You can visit different websites, forums, or discussions in Steam itself and let others know you have a copy you’d like to trade away. You can discuss with others what you’d like in return and strike up a deal. If you have any extra tips in addition to these posted here, place them in the comments below and we may add them to the article itself. Now, go play some games!